Business Ethics Highlights brings you the day’s business news as it relates to business ethics. We also occasionally post links to professional and scholarly conferences related to business ethics, and to jobs in the field. BEH occasionally publishes Original Content (on the website, in PDF format) at the discretion of the Curators. BEH does not accept unsolicited submissions. 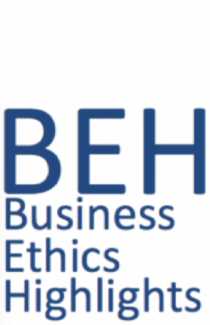 BEH is curated by the editors of the Business Ethics Journal Review, professors Chris MacDonald and Alexei Marcoux, and is published by the Journal Review Foundation.